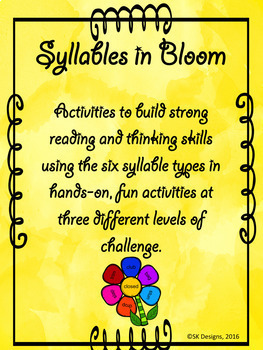 Syllables in Bloom uses games and activities to help students learn the six basic syllable types and develop automaticity with them for reading success. The activities can be done in centers, as a class, in groups, or independently! 1. 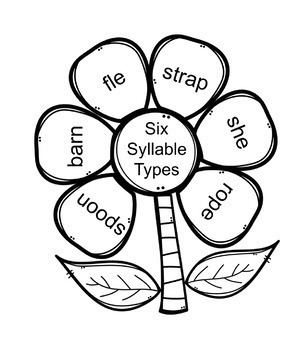 Syllable types are taught and practiced in isolation until students are ready to tackle mixed syllable types in reading activities. 2. Syllable types are mixed for practice as the students demonstrate proficiency with individual syllable types. 3. Syllable types are collected from a variety of sources by students independently. 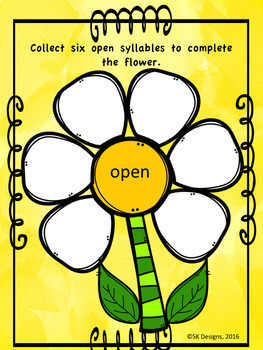 All of the games and activities in this product are built around building flowers with syllables. The activities, prepared by a language therapist and reading instruction specialist, are research-based. They are appropriate for a wide range of learners including students who are learning to read, improving their reading skills, struggling with reading, dyslexic, or facing learning challenges that interfere with reading progress. The activities provide a fun way for students to practice the foundational skills needed for reading success. The pages for these activities are provided in color or black and white for printing convenience. 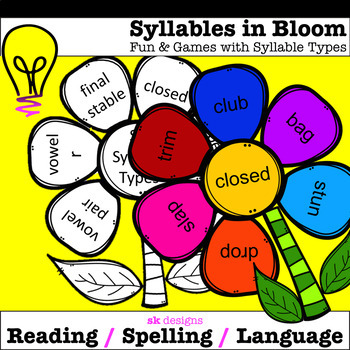 The completed flowers from these activities can be used to make a colorful bulletin board display. Thank you for previewing this product. It is our sincere desire to make products that benefit teachers and help students learn and grow. Your feedback is appreciated!